Fuzzball & Scuzzball - Beyond Reality! Comic 223 - Beyond Reality! 24th Jul 2014, 10:15 AM in Meanwhile! Udanax previously appeared in this comic here. But what about those other two guys? Udanax, H-Bomb Ferguson, and TH are characters from the comic strip Don't Quit Yer Day Job, created by superstar artist Matt Kish and me back in the early 2000s. 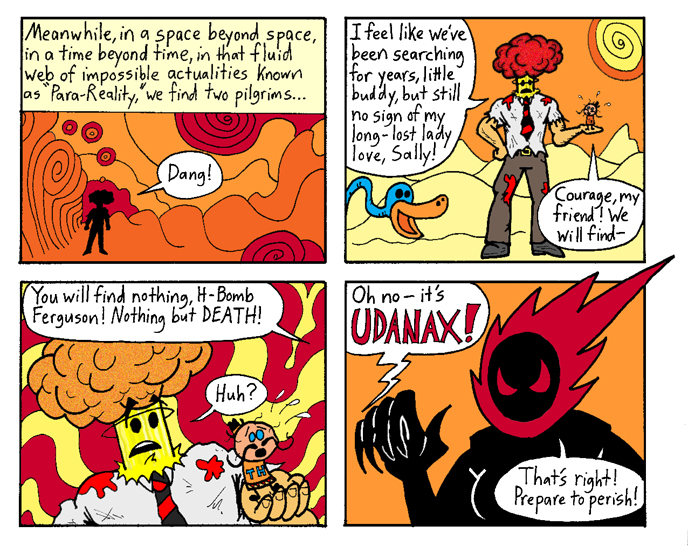 That comic ended with H-Bomb and TH journeying into the para-reality to find Sally, as mentioned above. I don't plan on actually continuing that story here, but I thought it would be fun to check in on those characters, just for a few panels. Is that self-indulgent? Sure, but you can blame Matt--he's the one who started reminding me about these comics, and how much fun it was to make them. Warning! The cast of characters is made up of people we knew and it is incredibly in-jokey. Book 2 is a fairly straightforward anti-corporate action story, though, and may somewhat stand on its own. Anyway, this is Matt's fault, but it was a labor of love, and a tribute to the good ol' days.